Mein Vortrag "Das Internet als Moralische Anstalt; Digitale Medien – Ein historischer Ansatz" ist nun in Buchform in Think CROSS - Change MEDIA. Crossmedia im Jahr 2014 - Eine Standortbestimmung von Christine Goutrié, Sabine Falk-Bartz , Ilona Wuschig (Herausgeber) erschienen. Paperback 348 Seiten ISBN 978-3-7357-3780-9 Verlag BOD – bei Amazon als Taschenbuch sowie eBook. Informationen zur Konferenz sowie meinem Beitrag. Das Internet in der Form in der es allgemein rezipiert wird existiert nicht. Wir haben gemeinhin eine gewisse Vorstellung, wie das Netzwerk, das gewissermassen “hinter dem Vorhang” stattfindet auszusehen vermag. Unser Bild des WorldWideWeb das als Synonym und abwechselnd mit dem Begriff “Internet” verwendet wird (obwohl es nur eines von vielen technischen Kommunikationsprotokollen ist) ist genauso verzerrt wie das der Kanalisation, die unsere Körper in noch weitreichenderer Form verbindet als das Internet unseren Geist. With the death of Steve Jobs - someone who shaped the technology of everyday life over the last 20 years with his obsession of design and usability - we become aware of the impermanence of life much more than through some philosophical or religious text. The WSJ is much more competent at writing an obituary - alas I don't even know how long the link to the WSJ story will hold. Apple changed their homepage to honor their founder and leader. Steve Jobs leaves the way he came and started - focused on the essentials: Ars longa vita brevis. I have been invited to submit a paper about the future for a forthcoming book on "Ideas for Tomorrow". The future, tomorrow, great new ideas that will change everything for the better are exciting prospects but I'm not so sure how helpful it is to look at the "future" as a point forward on an imaginary unidirectional time line. Looking at the present may be more inspiring and educational. Looking at the present is also more about social interactions and less about prospective technical achievements. Over the past 50 years a lot of "future" has turned into a past without ever becoming present reality. Robot maids are a perfect example. "Morgen ist heute schon gestern" (Tomorrow, today will already be yesterday) was part of an advertising campaign of the Austrian shoe manufacturer Humanic in the 1970s. (the other one was "In Wirklichkeit ist die Wirklichkeit nicht wirklich wirklich, aber wirklich ist so doch" - in reality, reality is not really real, but it is real nevertheless) - but I digress). Looking at today - in their presence - and looking at how things evolve, start, end may be a much more solid approach that I will try to explore. While thinking about this blog entry, I got completely side-tracked and as Leonard Cohen and Marcel Proust started to get intermingled, I got stuck with MP - especially as I found this audio piece of Albertine disparue. Revenons à nos moutons: (let's get back on track) The way in which we attach memories to music shows that the medium is the memory - serves as artificial memory in the way Raymundus Lullus understood it. Is it close to Synestesia, when one sensory modality evokes a stable percept in another modality? Like sound - color, Skriabin was famous for having it - or is it the memory of an early evening when the wind starts to pick up and it get's just a bit too cool to sit outside comfortably with a glass of red wine? Memories come in all shapes and tastes. As small shell-shaped cakes, as music, as a smell in mid-air on a warm summer afternoon. Calling Madeleines “cookies” would be a disservice not only to these unique creations but also to the American public that mostly draws its memories from Oreos, which are not as good as their name "Poli Oreo" may imply, or those oversized, shapeless, and overly sweet affairs called “freshly made chocolate chip cookies” that better bear no memory value (but they do of course) - as they would be disappointed. The large coffe chain with the Mermaid has solved the problem by adding large amounts of sugar and even chocolate coverture to make the Madeleines desirable. Sweeten your memories. 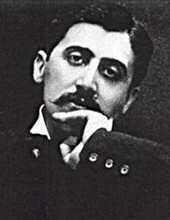 I recently discussed the topic with a friend and this resulted in an evening of Proust - despite the fact that the first volume was nowhere to be found in the whole house. Her house is a perfect place to read Proust – with very strong tea, the kind preferred by old cultures with a tradition, some Madeleines and the promise of home-made Madeleines – soon. The complete text of the Bibliothèque de la Pléiade, par Jean-Yves Tadié is available online and in a new bilingual version with the C. K. Scott Moncrieff translation. There is even an audio version of Albertine disparue: "Le départ et la mort d'Albertine, racontés par une jeune fille qui pourrait avoir son âge. Idéal pour écouter l'été au soleil, dans le jardin, sur la plage, au lit..." listen or download. The Lift@Austria conference invited me to give a keynote and enable a workshop about metamorphosis â€“ a somewhat alchemistic topic. The conference focuses on "Profound innovation in Society, Economy & Knowledge Exploring the new paradigm for bringing forth game-changing innovation" and will be held inÂ Vienna, March 18-20, 2010. Conferences worth attending have become rare or unaffordable and inaccessible like TED or D - mostly easily replaceable by a Webcast. Lift promises to start a new trend in collaborative events. The topic is challenging and we'll see what we can make of it. It will be a joint effort of everybody attending. Lift conferences are planned around the world and try to answer the questions " What can the future do for you? - maybe we should ask "What can you do for the future?" - but that's beside the point - there is only NOW. What can NOW do for you? I got a holiday present - a Moleskine desk calendar. Very nice and also very scary. Every day you rip off a page. You feel the impermanence of paper and your life within the ripping movement of your hand. A few moments - a few days - can be kept in a small pocket in the back of the calendar. This feeling of detachment of the pages translates into non-attachment to time and objects. A digital calendar cannot and will not offer this sensual experience. The video gives a joyful experience how to rip through a year and keep a few memorable days. It is beautiful, yet I think I'm still a calendar book type of person. Still too attached. Still too interested in memory. And what will I do with the days I rip off?